It's already ramping up to be an exciting year here at Yahoo! We are working hard to make sure you have access to the tools and resources you need in order to make the most out of 2017. We will continue to update the new Partner website with current, relevant information throughout the year. If you have any questions or would like to discuss new opportunities further, please contact your Partner Manager. We are excited to be able to offer Yahoo's rich library of content for your users! Yahoo: Tech, Movies, Travel, Style, Music, Politics, Autos and more! Content Teasers will be available across platforms, including desktop, tablet and mobile. They will have global coverage and will be available in the following markets: USA, UK, Brazil, Indonesia, Taiwan, Germany, Italy, India, France, Mexico, Hong Kong and the Philippines. 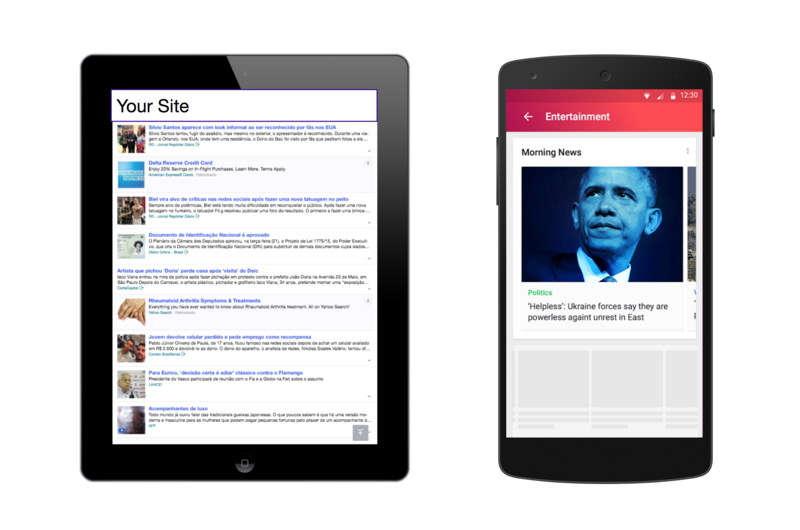 The Yahoo Content Teasers API provides a JSON stream of trending article headlines from the Y! Network plus premium ads from Yahoo's Native Ad and CPI marketplaces. Please contact your Partner Manager if you would like to learn more. We are aware of the recent outages on the Partner Insights reporting system and the effect these outages have on Partner business. We are doubling down and applying a tremendous amount of resources to improving and driving increased efficiencies across this system. We are cognizant of the volume of outages over the past calendar year and thank you for your continued patience. We understand the importance of providing fast, reliable data is essential to our collective success. Please contact your Partner Manager if your business continues to experience problems. The Yahoo Search results page is getting a fresh look! The Yahoo product team evaluated and tested 13 elements of the current header in order to identify opportunities to boost engagement and optimize design and functionality of the search box. After testing various combinations of changes, Yahoo has released the new "Magical Header" that leverages these improvements and insights. Once the Magical Header was released across Yahoo.com, users engaged more with the new search results page. Users also stayed on the page longer and clicked on more ads and algo results. They typed in +2% more searches in the search box and fewer of these searches were for alternative search engines. The abandonment rate and search engine switch rate both decreased by ~5%. The final result was a +3% increase in revenue. The Magical Header has launched for fully hosted desktop Yahoo Hosted Search Partners and Partners driving to search.yahoo.com. This update should lead to higher user engagement and revenue. Download the Magical Header case study study here. Summary: Yahoo has been a pioneer in efforts to explore and address the human rights impact of our business decisions, operations and strategy, and in 2008, we launched the industry's first business and human rights program. Background: Technology has transformed how we live, play, work and interact with one another and our connected world offers remarkable and novel opportunities on all these fronts. It also presents companies with complex challenges, particularly in the areas of privacy and free expression. It's no secret that there are governments around the world who don't live up to widely recognized standards for protecting the free expression and privacy rights of their own citizens. While the root causes of these threats clearly lie with those governments, it is also clear that all companies have a responsibility to respect human rights. A company's ability to manage human rights risk and maximize opportunity to respect and promote human rights can directly impact user engagement. Recognizing this, Yahoo has taken a unique approach to encourage responsible decision-making on human rights throughout our operations. Yahoo's Approach: In 2008, Yahoo established its Business & Human Rights Program (BHRP) to coordinate and lead our efforts to protect and promote free expression and privacy. The BHRP works to inform business decision-making and also looks for ways that Yahoo can promote human rights through its products, services and platforms. Yahoo's dedicated business and human rights team advises internal teams on the free expression and privacy risks and opportunities associated with our business decisions. The core business and human rights team draws on the expertise of a virtual team of Yahoo employees across the company to inform its efforts to advise on global business strategy, industry initiatives, business decision-making and internal and external stakeholder engagement. Yahoo's BHRP performs human rights impact assessments to identify circumstances when freedom of expression and privacy may be jeopardized or advanced. Yahoo is a founding member of the Global Network Initiative and has committed to follow the Global Network Initiative Principles on Freedom of Expression and Privacy. The BHRP also engages with a wide variety of external Partners to continue to inform its efforts. Yahoo's BHRP works to consider risks to the rights to privacy and free expression associated with our business ventures, including our partnerships. As part of these efforts, Yahoo includes certain contractual language in many of our Partner agreements to reflect its commitments in these areas. Interested to learn more? Reach out to your Partner Manager to learn more about Yahoo's approach to human rights and how it relates to our partnerships.